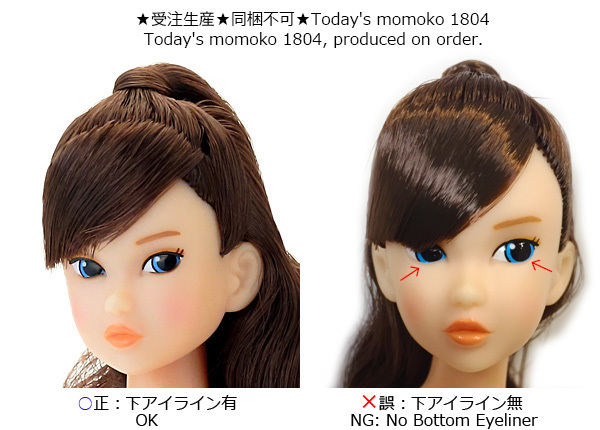 The lack of the bottom eyeliner of "Today's momoko 1804, produced on order". > The lack of the bottom eyeliner of "Today's momoko 1804, produced on order". on October 26, have no bottom eyeliner with her face. Please kindly check if the doll has bottom eyeliner, referring the photo. If your doll has no bottom eyeliner please follow the below procedure. A) In case you would like your doll to be exchanged. Please send us an email with the title "Exchange Tm1804" to "store(atmark) petworks.co.jp"
including the photo of the momoko face. we will be able to accept exchange. (meanwhile you can play with the doll, taking her out of the package). B) In case you would like to return the doll. Please send us an email with the title "Return Tm1804" to "store (atmark) petworks.co.jp"
We will send you how to return your doll and receive the refund afterwards. C) In case you would like to keep the doll. Please just keep your doll.